35 civilians died in alleged US-led Coalition strikes on the city of Raqqah, according to local media. In the first week of February, a number of local sources reported on the exhumation of bodies from “the area south of Al Ma’ari school”. More bodies were found and after a query from an Airwars researcher, RBSS stated that more than 35 civilians had been present in the building when the airstrike took place. A number of these bodies could however not be identified due to the heavy decomposition. On February 14th RBSS reported that the bodies of four children and their father were recovered “two days ago from the building next to the school of Al-Ma’ari.” Included in the report were photos of the family’s grave and a document reading their names. In a video by France24 Khaled Khalaf al Salama’s wife, who survived the bombardment, mentions that she has also lost her mother, sister and niece. RBSS confirmed to Airwars that they were all killed in the same airstrike. On April 4th, local sources reported that another four bodies were taken from under the rubble “in a building next to Al-Ma’ari school”. Euphrates Post did not specify the date on which the people died, only mentioning that they were killed “during the recent campaign against the city.” Still, only 27 of the 35 civilians that were killed in the incident have been found at this same location – making it likely that the four recently exhumed persons were killed in the same bombardment. In a May 2nd interview with Arab24, a rescuer who is standing at the location of the incident, states that “Most of the bodies we are pulling out are unidentified. There were about 200 bodies that were identified, we handed those over to their families.” Later, he addresses that in al Ma’ari area, “we have pulled out about 20-25 bodies. Some of them were identified and others remain unidentified.” Due to the heavy bombardments in the area around that time, Airwars researchers cannot determine if these bodies are related to this specific incident. It should be noted that in a private correspondence with Airwars researchers, RBSS stated that the Badou neighbourhood was targeted heavily around the time of this incident. This event may be related to S1352a as it is located in the same neighbourhood. However, Airwars researchers have indicated that Al Ma’ari school and the water well mentioned in S1352a are in different areas – making them two separate incidents. This incident was initially assessed as being related to an October 3rd incident in Raqqa (S1396b). Further research found that the bombardment was dated September 25th. Airwars researchers created this separate incident on March 1st. At least one civilian was killed with perhaps four or more additional casualties after a Coalition airstike near Al Hana hospital in Abu Kamal, according to local media. While a number of sources didn’t identify the culprit, at least two attributed the incident to the US-led Coalition. In July 2018 the alliance accepted responsibility for unintentionally killing one civilian. Euprates Post reported that “warplanes launched an air strike at dawn today targeting a building near al-Hana Hospital in the city of Abu Kamal, with reports of civilian casualties”. Marsad al Hassaka provided some more information, saying that “a displaced family and a civilian young man from Abu Kamal” were killed in a Coalition strike near Al-Hana hospital. Step also blamed the Coalition for conducting strikes near the hospital, which resulted in an unspecified number of civilian casualties. In its July 2018 civilian casualty report, the Coalition took responsibility for the event, noting: “September 25, 2017, near Abu Kamal, Syria, via Airwars report. During a strike on Daesh Headquarters one civilian was unintentionally killed.” Officials confirmed that this related to event S1351, and gave the coordinates (to within 100 metres) as 34° 27.151′ N, 40° 55.086′ E.
Reports of the incident mention the area around the Al Hana (الهناء) hospital in the city of Abu Kamal (البوكمال). The coordinates for the hospital are: 34.452838, 40.917828. During a strike on Daesh Headquarters one civilian was unintentionally killed. According to Raqqa is Being Slaughtered Silently, Raqqa24 and the Shaam News Netowork, a number of civilians were killed and wounded when they were hit with artillery shells as they gathered to collect water in Raqqah’s al Badou neighbourhood. Reports of the incident mention the area near a water well in the neighbourhood of Badou (البدو) in the city of Raqqa. Airwars was unable to verify the location of the water well, however, the generic coordinates for the neighbourhood of Badou (البدو) are: 35.961778, 39.006083. Local press sources said that dozens of civilians were killed following alleged US-led Coalition strikes on Qaem district, west of Anbar during a major offensive by ISF. According to Yagein, residential neighbourhoods of the district were targeted resulting in the death of civilians. Yagein held the Coalition responsibly. Anbar News said houses of the Al Bajda’an and the Al Boumhul clans were destroyed, in addition to the houses of the dear mum on Alhuli. The local outlet referred only to heavy shelling and did not specify a culprit. Reports of the incident mention the city of Al Qaim (القائم), in the west of Anbar province, for which the coordinates are: 34.3957715, 40.9943684. Due to limited satellite imagery and information available to Airwars, we were unable to verify the location further. For September 24th – 25th the Coalition reported no strikes in Al Qaim. In a previously untracked event, on December 28th, 2017 the Coalition admitted responsibility for an incident, reporting: Sept. 25, 2017, near Al Jamahir, Iraq via self-report. During a Coalition strike which destroyed an ISIS headquarters, it was assessed that one civilian was unintentionally injured. Airwars is seeking additional clarification from the Coalition to assess in which of the two provinces the incident occurred. The Coalition report mentions Al Jamahir (الجماهیر), for which the coordinates are: 34.395000, 40.991944. Ten civilians – mostly women and children – reportedly died and dozens more civilians were injured in multiple airstrikes on different locations in Al Mayadin, local media reported, though sources were conflicted as to whether the Coalition or Russia was responsible. Qasiuoun laid the blame with the Coalition, reporting that jets struck “the comprehensive pharmacy” in the centre of al Mayadin. According to RFS Media Office, “Warplanes, believed to be Russia, carried out several air raids targeting different areas inside the cities of Al-Mayadin and Abu Kamal, east of the city of Deir Ghazur, resulting in a number of dead and wounded, mostly children and women. Justice For Life added that an “air strike at around 7 am this morning targeted a pharmacy next to the commercial bank in the town of Al-Ma’ayadin east of Deir Al-Zour, which led to its total destruction”. Reports of the incident mention multiple strikes on the city of Al Mayadin (المیادین), for which the generic coordinates are: 35.016667, 40.444167. One specific location mentioned is the Al Shamla (الشاملة) pharmacy and residential buildings near the Agricultural Bank in the city of Al Mayadin (المیادین). Airwars was unable to locate the pharmacy, however, the coordinates for the Agricultural Bank are: 35.017705, 40.456274. Eleven civilians including one woman and two or more children died and many more were wounded in an alleged Coalition airstrike on Markada, local media reported. All sources attributed the event to the US-led Coalition. The Syrian Network for Human Rights said that four non-combatants including two girls and a woman died. Insaan Rights Watch also put the death toll at four including two children. According to Jirstv and Shadadi media center two families were killed. Six people from a refugee Iraqi family were also reportedly killed. The Syrian Observatory for Human Rights reported that “the death toll is likely to increase because of the presence of people injured in serious conditions”. Reports of the incident mention the village of Markada (مركدة), Al Hasakah governorate. The coordinates for this village are: 35.765641, 40.771032. Five civilians were reportedly killed in alleged Coalition air or artillery strikes in Raqqa, local sources reported. Q_Alenzy reported that the Coaltion targeted a building near the “train station” and the “juvenile prison” along with “the Bedou neighborhood and Tawasu’iya with white phosphorus shells”. Raqqa24 added that the Coaltion carried out several raids on the Bedouin neighbourhood and “the surroundings of the municipal stadium and the expansion park”. Video depicting the targeting of the International Aviation Alliance building near the train station and juvenile prison in the city of Raqqa, posted by @saad_alsabr on September 24th, 2017. 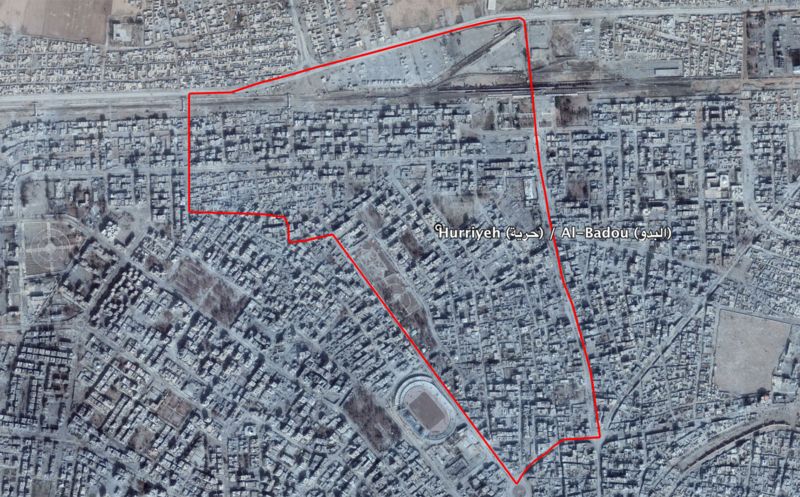 Reports of the incidents mention the city of Raqqa (الرقة‎), for which the coordinates are: 35.9505639, 39.0094148. Due to limited satellite imagery and information available to Airwars, we were unable to verify the location further. For September 24th-25th the Coalition reported: "Near Raqqah, 27 strikes engaged four ISIS tactical units and destroyed 29 fighting positions, three vehicles; and suppressed a fighting position."